Flea is the common name for any of the small, wingless, and laterally compressed insects belonging to the order Siphonaptera (or Aphaniptera). Fleas thrive in dark and damp (not wet) places and live as ecto-parasites of warm blooded animals like birds and mammals, feeding on their blood (hematophagy). The intimate association that human beings often have with their pets, such as household cats and dogs, is sometimes compromised by the infestation of fleas on such pets. In a way, the persistent presence of fleas in pets serves as an indicator for the need for greater care of the pets by the pet owners. Fleas can be vectors for serious diseases, notably bubonic plague. In the twentieth century, this led to the fleas being a focus for biological warfare. Kirby (2005), who notes that "plague fleas have a rich military heritage as vectors of disease," records efforts by Japan during World War II to develop a weapon using plague fleas. One such weapon was designed to be used against the United States in the Pacific theater in 1944, but apparently was foiled by the sinking of a submarine. Fortunately, after considering to use such weapons of devastating destructiveness against the continental United States, the Chief of Staff of the Imperial Japanese Army canceled the mission in March of 1945, considering it to be ethically unacceptable. Other nations, such as Canada on behalf of the Allies in World War II (as well as the USSR and Germany beginning in the 1930s) were active in this endeavor, and the United States became active after the Korean War, but eventually such programs subsided (Kirby 2005). Siphonaptera also is the name of a genus of foraminiferan protozoa. 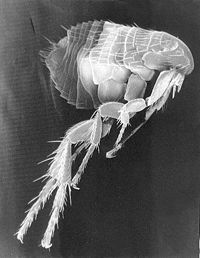 Fleas are small (1.5 to five mm long), agile, usually dark colored (e.g. the cat flea is reddish-brown), wingless insects. Their bodies are oval and laterally compressed, (i.e., flattened side to side) permitting easy movement through the hairs (or feathers, etc.) on the host's body. The head and thorax are relatively small compared to the enlarged abdomen. Fleas have short and thick antennae, only a pair of simple eyes or ocelli, and piercing and sucking type of mouthparts adapted to feeding on the blood of their hosts.The thorax consists of three pairs of long and stout jointed appendages; among them, the hind pair is especially well adapted for kinetic jumping—vertically up to 18 centimeters (cm) and horizontally 33 cm, about 200 times their own body length (Lyon 2007). The abdomen of the parasite is made of ten segments. The flea body is hard, polished, and covered with many hairs and short spines (bristles) directed backward, allowing the flea a smooth passage through the hairs of its host (Koehler and Oi 2003). Its tough body is able to withstand great pressure, likely an adaptation to survive scratching, and so forth. Even hard squeezing between the fingers is often insufficient to kill the flea; it may be necessary to crush them between the fingernails. Fleas are holometabolous (complete metamorphosis) insects, going through all the four stages of the life cycle; namely the embryo (egg), larva, pupa, and imago (adult). 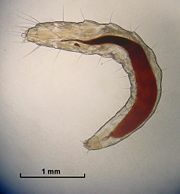 Adult fleas must feed on blood before they can become capable of reproduction (Koehler and Oi 2003). Thus, after a blood meal, breeding starts. The female begins laying a total of about 300 to 400 tiny white oval eggs soon after copulation. Eggs are laid in batches of up to 20 or so, usually on the host itself, which then easily roll onto the ground. As such, areas where the host rests and sleeps become one of the primary habitats of eggs and developing fleas. The eggs take around two days to two weeks to hatch depending on temperature and humidity (Lyon 2007). Micrograph of a flea larva. Flea larvae are small, cylindrical, and maggot-like in appearance, with neither legs nor eyes. The head is small but equipped with chewing mouthparts, while the body is made of 13 visible segments and a hidden terminal segment, all provided with rather sparse bristles to aid in crawling. They show negative phototaxis and avoid sunlight, keeping to dark places like sand, cracks, and crevices, as well as bedding. While the adult flea's diet consists solely of blood, the larvae feed on various available organic matter, such as dead insects, feces (including the feces of mature fleas), and vegetable matter (Bartlett et al. 2006). Given an adequate supply of food, larvae should pupate within 1-2 weeks. When ready to pupate, the larvae spin little silken cocoons that are viscid, so that particles of sand, dust, or lint readily adhere to them. After another week or two, the adult flea is fully developed and ready to emerge from the cocoon. They may, however, remain resting during this period until they receive a signal that a host is near—vibrations (including sound), heat, and carbon dioxide are all stimuli indicating the probable presence of a host (Lyon 2007). Fleas are known to overwinter or diapause in the larval or pupal stages. Once the flea reaches adulthood, its primary goal is to find blood. Adult fleas only have around a week to find food once they emerge, though they can survive two months to a year between meals. Thus, the life expectancy of adult fleas depends largely on food supply, temperature, and humidity. At low temperatures (60° F), well-fed fleas may live for several years. In the absence of a host, they have less endurance than ticks. Unlike most blood-sucking insects, fleas usually feed at frequent intervals, generally at least once a day. A flea population is unevenly distributed, with 50 percent eggs, 35 percent larvae, 10 percent pupae and 5 percent adults (Lyon 2007). Their total life cycle can take as little as two weeks, but may be lengthened to many months if conditions are unfavorable. Female fleas can lay 500 or more eggs over their life, allowing for phenomenal growth rates. Based on genetic and morphological evidences, it is supposed that fleas are related to, or even descendants, of the scorpionfly family Boreidae, which have good eyesight and either reduced or no wings (Grimaldi and Engel 2005). With their rudimentary wings, these flightless snow scorpions, also known as snow fleas, do resemble the fleas and seem to be close to the common ancestor of the 2000 or so currently known varieties of fleas. It is considered that they split off in many directions about 160 million years ago (Grimaldi and Engel 2005). Their descent with modification continued to produce adaptations for their specialized parasitic niche, such that they now have no wings and their eyes are covered over. The large number of flea species may be attributed to the wide variety of host species they feed on, which provides so many specific ecological niches to which to adapt. Previously, based on the similarities of the larvae, it had been believed that fleas had evolved from the flies (Diptera). Fleas attack a wide variety of warm-blooded vertebrates, including dogs, humans, chickens, rabbits, squirrels, rats, and mice. Fleas are a nuisance to their hosts, causing an itching sensation, which in turn may result in the host attempting to remove the parasite by biting, pecking, scratching, and so forth in the vicinity of the parasite. However, fleas are not simply a source of annoyance. Some people and animals suffer allergic reactions to flea saliva, resulting in rashes. Flea bites generally result in the formation of a slightly-raised swollen itching spot with a single puncture point at the center. The bites often appear in clusters or lines, and can remain itchy and inflamed for up to several weeks afterwards. Fleas can also lead to hair-loss as a result of frequent self scratching and biting by the animal. In extreme cases, they can lead to anemia. Besides the problems posed by their sucking of blood, fleas can also act as a vector for many diseases. For example, oriental rat fleas (Xenopsylla cheopsis) are the chief transmitter of the bubonic plague between rodents and humans by carrying the bacteria Yersinia pestis. Murine typhus (endemic typhus) fever, caused by Rickettsia typhi, and in some cases tapeworms (Hymenolepis sp. ), can also be transmitted by fleas. Flea "dirt" in the fur of a cat, is actually excess blood (from host) consumed by the adult flea, passed as feces. Flea bites can be treated with calamine lotion or 0.5-1 percent concentrated hydrocortisone cream. Itching can be lessened by applying menthol, camphor, or ice as well. Immediate bites from the adult flea can be prevented by the use of insect repellents like N,N-Diethyl-meta-toluamide (DEET) over the exposed skin and the outer clothing (Lyon 2007). Long term control of fleas can be achieved with a simultaneous and integrated efforts involving strict sanitation, pet treatments, and premises treatments (both indoors and outdoors). The medicines to control fleas need to be used with care. Phenothrin (85.7%) in combination with Methoprene was a popular topical flea/tick therapy for felines. Phenothrin kills adult fleas and ticks. Methoprene is an insect growth regulator (IGR) that interrupts the insect's life cycle by killing the eggs. However, the United States Environmental Protection Agency (EPA) has pressured at least one manufacturer of products containing these compounds to voluntarily withdraw some products and include strong cautionary statements on others, warning of adverse feline toxicity. The Phenothrin was believed to be the cause of the adverse reactions (EPA 2006). Lufenuron is veterinary medicine that attacks the larval flea's ability to produce chitin, thus breaking the life cycle. A combination of etofenprox (55.0%) and pyriproxyfen (2.2%) is another formulation used in Sergeant's Gold treatment for cats. Fleas can be controlled in dwellings by application of borax, diatomaceous earth, and other insecticides to floors, furniture, and carpeting. Bartlett, T., P. Coin, and R. McLeod. 2006. "Order Siphonaptera: Fleas." BugGuide. Iowa State University Entomology. Retrieved May 6, 2007. Kirby, R. 2005. "Using the Flea as Weapon." Army Chemical Review. July-December (2005): 30-35. Retrieved May 6, 2007. Koehler, P. G., and F. M. Oi. 2003. Fleas. University of Florida, Institute of Food and Agricultural Sciences. Retrieved May 6, 2007. Lyon, W. F. 2007. Fleas. HYG-2081-97. Ohio State University Extension Fact Sheet. Retrieved May 6, 2007. U. S. Environmental Protection Agency (EPA). 2006. Hartz Flea and Tick Drops for Cats and Kittens to be Cancelled. EPA. Pesticides: Topical & Chemical Fact Sheets. Retrieved May 6, 2007. This page was last modified on 29 August 2008, at 13:57.